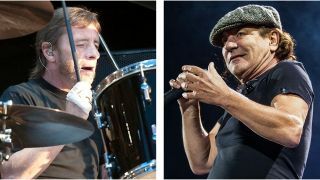 Estranged AC/DC members Brian Johnson and Phil Rudd have been photographed together in Vancouver. Johnson was forced to stop touring with the band back in 2016 under the threat of permanent deafness, with AC/DC bringing in Guns N’ Roses frontman Axl Rose to complete their Rock Or Bust world tour. Rudd, meanwhile, was kicked out of the Aussie band the same year after being found guilty of drugs possession and making death threats and subsequently served an eight-month home arrest sentence. Drummer Chris Slade was recruited for AC/DC’s live dates. But now the pair have been photographed together, with the snap appearing on The Georgia Straight – the same website which recently claimed that Rudd and AC/DC guitarist Stevie Young were spotted in the city. The picture of Johnson and Rudd has reportedly been snapped outside Vancouver’s Warehouse Studios where AC/DC have recorded their last three albums, and shows the pair laughing over a cuppa. Is something else brewing in the AC/DC camp? Johnson has been working with with audio experts Asius on a solution to his hearing problems, with Beano taking to the stage following his departure from AC/DC with Muse, Paul Rodgers and, most recently, with Mick Fleetwood at the Fleetwood Mac drummer’s restaurant in Lahaina, Maui.